The hopfions were conjectured to exist in two-component superconductors [E. Babaev, L.D. Faddeev, A.J. Niemi "Hidden symmetry and knot solitons in a charged two-condensate Bose system", arXiv:cond-mat/0106152v1 (2001); Phys. Rev. B 65 100512 (2002) ref], stabilized by self-induced magnetic field. The subsequent numerical studies performed on the simplest two-component Ginzburg-Landau model did not reveal the existence of stable hopfions [J. Jäykkä, J. Hietarinta, P. Salo "Topologically nontrivial configurations associated with Hopf charges investigated in the two-component Ginzburg-Landau model", arXiv:cond-mat/0608424; Phys. Rev. 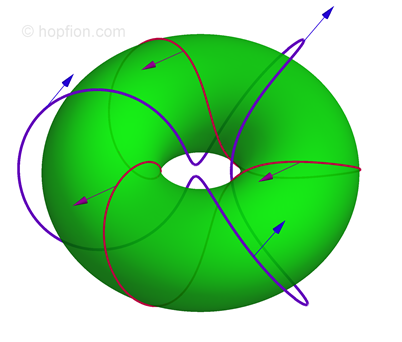 B 77, 094509 (2008) ref], [J. Jäykkä, J. M. Speight "Supercurrent coupling destabilizes knot solitons", arXiv:1106.5679; Phys. Rev. D 84, 125035 (2011) ref]. Mathematical generalisations of a Ginzburg-Landau model that support stable hopfions were proposed [R. S. Ward "Stabilizing textures with magnetic fields" arXiv:hep-th/0207100; Phys. Rev. D 66, 041701(R) (2002) ref] and numerically solved [J. Jäykkä, J. Palmu "Knot solitons in a modified Ginzburg-Landau model" arXiv:1102.2259v1; Phys. Rev. D 83, 105015 (2011) ref], but this formal generalisation did not correspond to any superconducting model, rather highlighting instability of hopfions in superconductors. In [F. N. Rybakov, J. Garaud, E. Babaev "Kelvin knots in superconducting state", arXiv:1807.02509v1 (2018)] it was demonstrated by numerical simulations that retaining current-current interaction, also known as the Andreev-Bashkin term, in two-component superconductors under certain conditions provides stability for hopfions. Apparently, the state where the relative strength of this interaction is significant, corresponds to being in a vicinity of Fulde–Ferrell–Larkin–Ovchinnikov instability. It is interesting to find out which materials are effectively described by the two-component model and can be explored near certain critical points. This page is not complete and if you find inaccuracies, if you have any comments or additional material - do not hesitate to contact us.